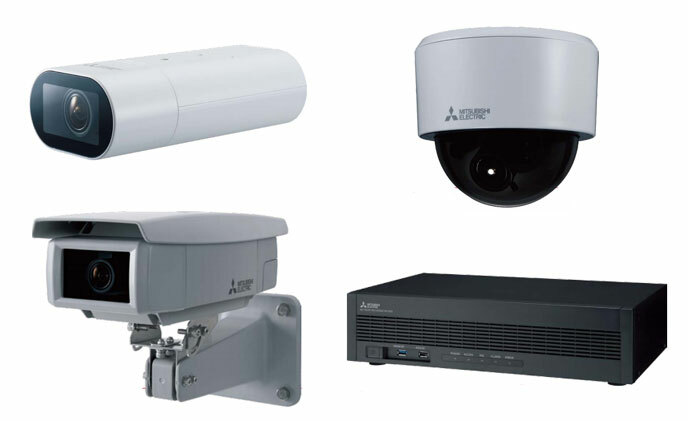 Mitsubishi Electric Corporation announced it will unveil in June a new digital video surveillance system offering high performance, versatility and scalability for diverse security applications. The system records at 30 frames per second in Full HD (2.0M pixels) resolution from 16 cameras used in parallel, with compensation provided by Mitsubishi Electric’s own super-resolution technology, including for electronic zoom. The 7000 series network cameras come with new digital sensitization and backlit compensation technologies for sharper, clearer images. Digital sensitization suppresses after-images and blur for fast-moving objects in low-light conditions, providing eight times greater sensitivity than conventional model. Backlit compensation adjusts blur to produce more natural images, including under strong backlit conditions when large differences exist between bright and shaded areas, such as building entrances. The backlit compensation feature is four times more sensitive than conventional mode. The 5000 series network video recorder can be connectable to up to 32 cameras (16 directly and another 16 through a hub). Reliable extended-duration recording is possible thanks to the use of large-capacity redundant HDDs. Remote monitoring is possible via PCs, smartphones or tablets for greater flexibility according to surveillance needs. Compared to Mitsubishi Electric’s existing network recorders, the 5000 series network recorder uses 25% less electricity and requires 30% less space for installation. Such efficiencies notwithstanding, the 5000 series is a highly robust unit offering 32-camera capability. The growing market demand for surveillance is requiring more versatile and functional systems in terms of visual quality, camera capacity, recording time and connectivity with smartphones and other remote monitoring devices. Digital surveillance systems by Mitsubishi Electric are in wide use in buildings, large facilities, convenience stores, supermarkets and many other locations. The company is confident that its all-new system built with new 7000 series cameras and 5000 series recorders will meet with great acceptance among global customers who are in need of high-quality, high-performance security systems.